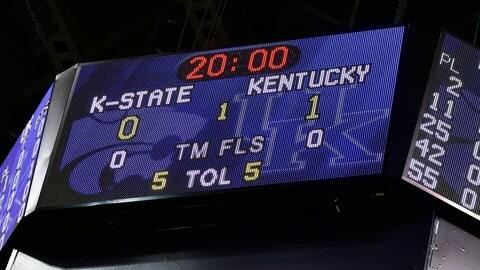 The scoreboard show Kentucky Wildcats up 1-0 over the Kansas State Wildcats prior to the tip-off after technical free-throws were award to Kentucky in the first half during the 2nd round of the 2014 NCAA Men's Basketball Championship at Scottrade Center. ST. LOUIS (AP) — Seldom-used Kansas State guard Brian Rohleder made sure he’d make it into the box score Friday night, just not in the way he or anybody else on the Wildcats’ bench had hoped. Rohleder, who had played 31 minutes all season, was called for a technical foul for dunking in pregame warm-ups before No. 9 seed Kansas State played No. 8 seed Kentucky in the Midwest Regional. NCAA tournament rules prohibit players from dunking with less than 20 minutes left before tip-off. Rohleder, a sophomore who walked onto the program, dunked with 19:58 showing on the clock. Andrew Harrison took the two free throws for Kentucky, missing the first and making the second, and giving his team a 1-0 lead when the game finally started.